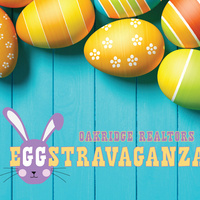 Oakridge Realtors, University of Iowa Community Credit Union and Scheels are proud to present the 5th annual Easter Eggstravaganza. Spend a fun-filled morning inside the UNI-Dome for the best Easter Eggstravaganza around. There will be games, face painting, balloon animals, bounce houses, refreshments, pictures with the Easter Bunny and a Easter egg hunt with over 30,000 eggs!